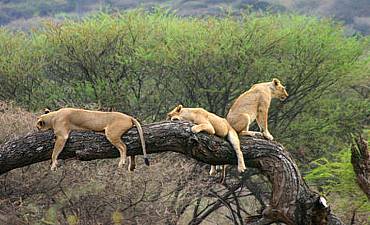 Want An Adventure Safari In Manyara? Scroll Down For Activity Details..
An adventurous Lake Manyara safari offers various activities to meet the interests of AfricanMecca guests with differing objectives and levels of fitness. Young or very active visitors may enjoy mountain bike tours, long walking treks, fly camping and even abseiling from the red-brown rock walls of the escarpment. They may leap and dance with Maasai warriors at evening campfire performances. Others may prefer to exercise relaxed patience on bird-watching forays or gentle walks around Mto wa Mbu town, and attend lectures on local wildlife, culture and community projects in the area. On a full day or half day safari, there is always an opportunity to take game-spotting tours of Manyara in specially adapted people carriers with four-wheel drive, pop-up roof and comfortable window seats for all. On board coolers for refreshments and two-way radios to enable guides to keep in touch, ensure that you will not go hungry or thirsty, and you will be kept abreast of any unusual activity in Manyara Park. You will certainly pass herds of ungulates grazing in the cool of the morning. You could catch predators carrying home the bodies of their overnight victims. You may be surprised to see a baboon trailing the corpse of a small duiker or a leopard hoisting its prey onto its larder in the fork of an acacia tree amidst traversing opportune hyenas. Before it gets too hot, wildlife mating rituals are performed with often stylized battles in which the contestants are rarely seriously hurt. In elegant neck-twining and synchronized walks, losing giraffes simply concede their superiority and walk away. Handsome black ostrich males wait in lordly disdain whilst their dowdy hens indulge in wing-arching and charging to frighten off would-be rivals, and elephants engage in lots of roaring and ear-flapping, waving their trunks and wisely digging their tusks into the ground, rather than into each other. The flora has similarly adapted to survive. 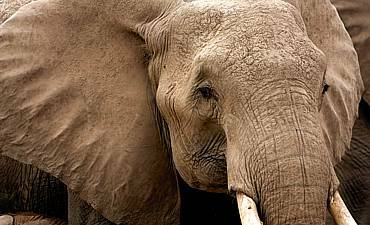 Giant baobab trees can withstand the depredations of elephants feeding on their bark. Valuable monolithic mahogany trees are similarly invulnerable. Late afternoon and early evening safari drives follow hordes of mammals descending to drink before retiring for the night, trailed by hungry killers, such as lions, or even the African wild dogs have been seen in rarity, that also hunt in packs by distracting, separating out and heading off their prey, and may be foiled by the defensive tactics of determined buffalo males, forming sweeping ranks to contain and deter the marauders. Sundowner cocktails in the bush as the light turns amber and skies flame and die to black embers, lit by brightly scintillating stars, are followed on your drive back to the camp (read more on where to stay in Lake Manyara), catching the eyes of nocturnal porcupine, bush babies and even aardvark and bat-eared fox as your AfricanMecca guide spots the sights you dreamed of when you planned to wondrously travel in Eastern Africa. 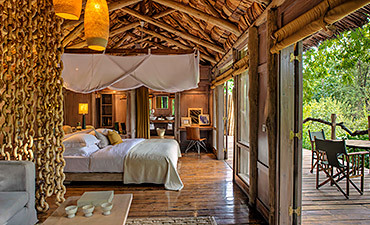 Accommodation in Manyara varies based on the experience and location sought. Some are located inside the park in the southern expanse while others are sited on the rim of the Rift Valley escarpment. Lake Manyara is a beautiful place to visit all the year round; though. the dry season of July to October is the best time for watching game that comes to Manyara from other ranges as water sources dry up. 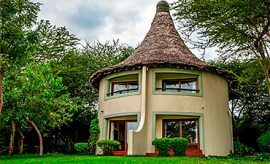 Jambo Raza: Everything was great from the the fantastic wildlife, the scenery, the people, the accommodations and the food. 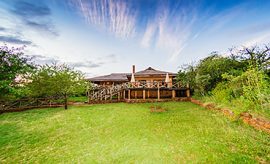 We went to Lake Manyara and stayed at Kirurumu Tented Lodge which was a great introduction for us on the safari. Loretta and I had a great time on our honeymoon. We both also really enjoyed our time in the Serengeti. We were able to witness the wildebeest migration and saw literally over 1 or 2 million animals trekking across the plains of the Serengeti. Jambo AfricanMecca Team, The safaris to Lake Manyara, Ngorongoro Crater and Serengeti were fantastic and very beautiful. All in all, the perfect trip for my son and myself. Thanks again and enjoy the pictures. My son took about 1500 pictures. When visiting Lake Manyara (Great Rift Valley Lake), we recommend combining it with your Northern Tanzania safari to Tarangire, Ngorongoro Crater and Serengeti (wildebeest migration). End your trip with a Swahili cultural tour and beach holiday in Zanzibar. ARE YOU PLANNING AN AFRICAN SAFARI TO LAKE MANYARA IN TANZANIA? HAVE YOU VISITED LAKE MANYARA FOR AN AFRICA SAFARI IN TANZANIA?